This past weekend, Tara and I took on our very first home improvement project in our house. We painted an accent wall! We both have pretty limited experience when it comes to painting actual walls, so we were a little nervous, but it ended up being surprisingly easy and only really took a few hours. I’ll even put a step by step in case someone actually deems my expertise worth emulating. Get samples ($3 each at Home Depot) and paint little patches of each. Don’t go thinking that floor/baseboard coverage is not necessary for this step. 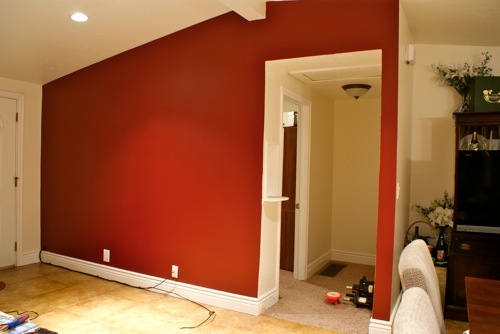 Even though the spots you’ll be painting are nowhere near anything, white baseboards attract red paint, especially if gravity is involved. Let the samples dry and evaluate under a variety of lighting. Go back and buy the winner. We like the paint that has the primer built in. Totally idiot proof. Remove outlet covers, etc. No, you don’t need to turn off the outlets at the breaker (Unless you have a propensity for sticking screw drivers in open outlets). Time to mask. This is by far the most time consuming part. Frog Tape is the way to go. Use a putty knife to help evenly press down the tape. Put on some music that fosters good, smooth brush strokes. Pink Floyd is absolutely perfect. Almost euphoric. Paint the edges with a regular brush. Evidently this is called “Cutting In“. Hit the rest of the surface with a roller. 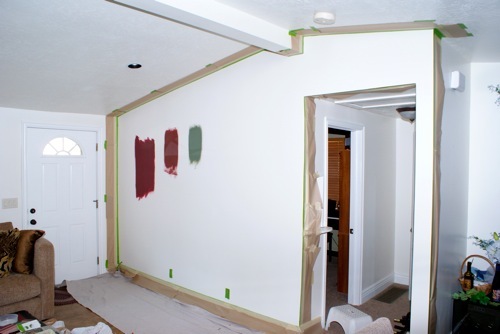 Turns out there is no wrong way to do this as long as you don’t press too hard and ensure each part of the wall receives several passes to evenly spread out the paint. I spent about half an hour watching videos online and each one described a different technique with at least one comment from a “professional” painter ripping the method shown. Let it dry for a few hours and repeat 5 & 6 (unless your skills are far superior to ours and you got it in one coat). Remove the masking. Frog Tape advises removing the tape while the paint is still wet so it doesn’t tear. This seems completely unpractical to me since multiple coats is almost always required. We waited until the paint was almost completely dry and didn’t have any problems. Love it- but I’d like to see it in comparison to the rest of the room/area.